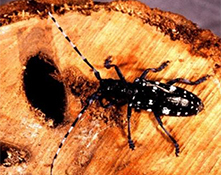 The asian long-horned beetle is host plant to all species of Maples, Sycamore, Horse Chestnut, Elms, Poplars, Willows, Birch, Hackberry, Mountain Ash, Cherry and various fruit trees. Adults feed on the leaves and bark of fine branches causing considerable damage. They prefer to attack the shoots of host trees causing the young shoots to wither and die. The female chews round or lip-shaped grooves in the bark of the trunk or large branches into which she lays a single egg. Young larvae feed in the green inner bark and cause scoring of the cambial layer. Mature larvae bore into the xylem of the tree and create large, winding galleries in the inner wood eventually killing the host. Adults chew their way out of the wood creating large, circular exit holes. (9-11 mms). Infested trees are also prone to secondary attack from other insects and diseases. Yellowing foliage, pre-mature leaf drop, and bleeding of sap from egg laying sites are other indicators that the insect is present. Accumulation of coarse sawdust on branches and at the base of the tree can indicate larval feeding. 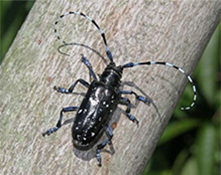 In its native range, this insect may have a one or two year life cycle. It has the ability to overwinter as an egg, larva or pupa. The large adult (20-35 mms long) emerges in May and populations peak in early July. They fly for 2-3 days to feed and mate. The female chews craters or depressions in the host tree stem and branches to lay eggs (oviposition sites). Approximately 80 eggs per female are individually laid. The eggs hatch in 11 days. Early instars feed in the phloem and cambial layers. The larva goes through four instars and the 4th instar moves into the xylem. In early spring the mature larvae pupate in the wood. No practical insecticide treatment exists. The CFIA is continuing its inspections of imports and suspect sites. 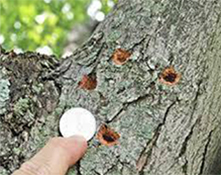 Complete removal of all trees within 400 meters of an infested tree has been the practice in Ontario.